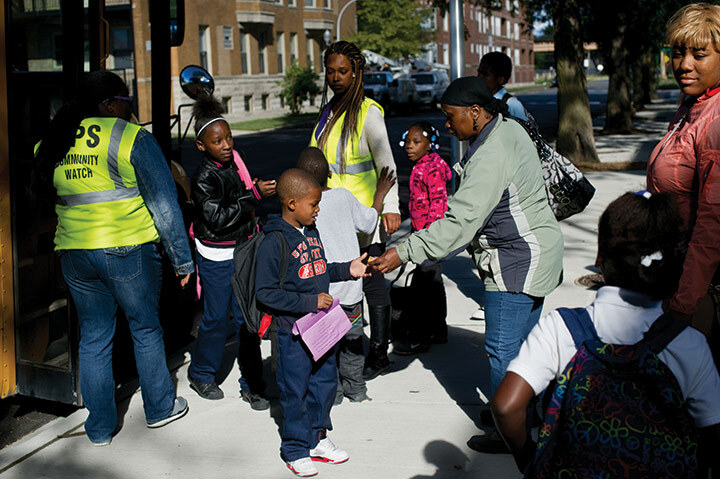 More than 90 percent of students displaced by the mass school closings in 2013 went to higher-rated schools, but less than one-fifth went to the top-rated schools, according to a Consortium on Chicago School Research report released today. The distinction between the two categories–better performing and top performing–is important. The Consortium’s much-cited 2009 study on past school closings found that only those students who landed at top schools after a closing experienced substantial academic improvement. Students who went to schools that were only somewhat better didn’t improve much academically. The new study is the first major report on the historic closings of some 50 schools, an action that displaced more than 11,000 students. The authors call the fact that few students went to top-performing schools “problematic.” However, Consortium researcher Marisa de la Torre said that nothing will really be known about how the closings affected the performance of individual students until future studies are done. CPS officials promised that schools designated to take in displaced children would be better than those that were shuttered. However, as has been reported, some of the designated schools were only marginally better, and many of the children went to other schools: Only one-third of students actually enrolled in their welcoming school. The researchers judged schools based on their ratings under a district system that uses multiple factors, including attendance and test score improvement. The year after the closings, some of the schools saw a significant drop in their district ratings and performance on standardized tests. For the 2009 study, however, researchers judged schools based only on test scores. De la Torre said that researchers decided to use the district ratings for the new study because that is the system CPS uses. The new report found that if all students had gone to their designated welcoming school, more children—27 percent compared to 20 percent–would have landed at top schools and fewer at the worst schools. Surprisingly, children assigned to low-rated welcoming schools were more likely to attend them, compared to children assigned to highly-rated schools. To determine why, the Consortium interviewed parents from closed schools about their priorities when choosing a new school. “What we found is that all parents really want the same thing,” said researcher Molly Gordon. The answer researchers got echoed what parents said repeatedly at the public hearings on the closings: The No. 1 factor in school choice was proximity. West Side activist Dwayne Truss said that the decisions involve matters beyond just convenience. He noted that in North Lawndale, in particular, many of the welcoming schools didn’t make sense for parents because they were far away or in areas that parents considered different neighborhoods. Safety was also found to be a consideration. Parents did consider the quality of the school, but researchers found that parents’ definition differed from the district’s. For example, the parents looked for small class sizes, good communication and things like after-school programs. A new report from the Consortium on Chicago Schools Research offers a sobering look at racial disparities in disciplinary actions at CPS high schools. Among the findings: 30 percent of high school students with a documented history of being abused or neglected were suspended in the 2013-2014 school year. District officials have been meeting with community groups to discuss two proposals: One would completely eliminate retention, the second would severely limit its use. Either change would mean a complete overhaul of a CPS policy that gained national attention nearly two decades ago. Back in 2006, Chicago researchers released a startling report on the post-secondary success of CPS students. The study ultimately concluded that just eight of every 100 high school freshmen would end up getting a college degree. The numbers were worse for black and Hispanic boys. Only 4 percent obtained a degree.